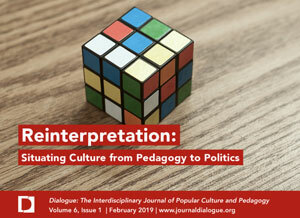 The post-racial perspective of many millennial college students can make it challenging for faculty to engage students in serious conversations about race in America and the relationships among popular culture, political culture, and race-conscious policies. This article outlines a three-week unit from a course entitled Popular Culture and Politics that uses Gone with the Wind (1939) and 12 Years a Slave (2013) along with academic and popular articles to walk students through three interconnected concepts: (1) the conflicting images of slavery as a system in American political history; (2) the role of popular culture in constructing and disseminating those images; and (3) the connections between the cultural understanding of America’s racial history and the contemporary political landscape. This piece provides an overview of the objectives of each section of the unit, including summaries of readings, sample discussion questions, and a summative assignment–all of which can be adapted for a variety of disciplines. Allison Rank is an assistant professor of Political Science at the State University of New York (SUNY) at Oswego. Her research interests include the political history of youth, youth political organizing, American political development, the intersection of politics and popular culture, and political science pedagogy. Her work has appeared in the Journal of Political Science Education, PS: Political Science & Politics, and Citizenship Studies. Rank’s work can also be found at Academia.edu, https://oswego.academia.edu/AllisonRank.